Mainly a residential district as many residents are retired, work at home, or take the short commute to downtown Vancouver. A 25-block strip of Marine Drive serves as a commercial district, featuring shops, small offices, restaurants, banks, and other common amenities. West Vancouver is treasured by residents and visitors alike from around the world with its Seawalk stretches along the Pacific ocean and provides relaxing glimpses of bird and marine life. On the north side you will find Cypress Mountain providing excellent hiking and biking in the summer months and skiing and snowboarding in the winter. Take a day trip up the coast and around our shoreline to discover beaches and trails waiting to be enjoyed from Horseshoe Bay, a BC Ferry port. West Vancouver has numerous food and art markets that are found along popular streets, community centres, villages full of local shops and restaurants showcasing the West Coast culture and lifestyle. Beautifully built and meticulously maintained Design Marque home in an ideal location. This gorgeous family residence offers an exceptional layout with four bedrooms up including a beautiful master with spa-like ensuite and a walk-in closet. Main level gourmet kitchen is open to a great room, both of which lead to a level, private yard with hot tub. Also found on the main level is a den, powder room, walk-in pantry and formal dining room. The lower level features a recreational room with exquisite custom millwork and cabinetry. This beautiful residence is situated in a cul-de-sac in one of West Vancouver’s most popular neighborhoods, just steps from parks, beaches, golf, restaurants and schools. Simply stunning! Truly magnificent over 10000 sf mansion designed by Mason Kent with detached swimming building with 39' long pool set on the 32,000 sf lot in BP. It has 6 bedrooms, 10 bathrooms, 5 gas fireplaces, 2 large laundry rooms, 2 wet bars, steam room, gym, 2 kitchens with high end appliances, detailed woodworks throughout, triple glazed European windows and doors, backup generator, control 4 smart home, custom made walnut staircase, enjoy full of view from mountain to ocean and city on the huge covered sundeck all year long, gentle sloped driveway. Too many to be mentioned, come in experience yourself. Ultra-Modern living just steps from Stearman Beach. A contemporary open plan built by API Construction set over 3 levels with premium features throughout. Boasting a top of the line kitchen with high-end appliances, marble counter tops, built in wine fridge, espresso machine, feature wine wall and engineered hardwood floors throughout. Oversized eclipse doors lead out to a manicured flat yard with a glass covered, heated patio perfect for family entertaining. Above has 3 large-scale rooms including a master bed with its own private deck and ensuite with luxury free standing tub. More impressive features include a massive rec-room with wet bar and media room below, elevator, speakers throughout, security & camera system and A/C. A quiet neighbourhood close to shopping and great schools. Breath-taking views of the ocean, city & Lions Gate Bridge. This one of a kind ultra-luxury Home offers approximately 4100 sq ft of indoor living, this modern 5 bedrooms, 3 level home features a dazzling array of luxury features including a glass elevator, control 4 automation system, a sensational Italian kitchen with top grade MEILE appliances, wok kitchen, air cond, feature wine room and state of the art media Rm. The exceptional quality & attn to detail is evident throughout the entire home and must be seen to be truly appreciated. The property is beautifully illuminated at nighttime with 5 walk out terraces, water feature and 3 outdoor gas fire features. Walking distance to Chartwell & Sentinel Schools & Hollyburn Country Club. Conveniently located to Collingwood & Mulgrave Schools. Breathtaking Ocean views from this well maintained 5 bdrm, 4 bathroom, 2 storey family home on a 16,157 level lot with a private backyard in the prestigious neighbourhood of Cypress Park Estates. Main floor features family room with balcony access, dining room and kitchen with stainless steel appliances,master bedroom with 5 piece ensuite, large walk in closet and private balcony with magnificent views. Lower floor has large recreation room great for entertainment. Close to Shopping & Schools. Massive, gently sloping Upper Dundarave View Lot! This 18,000 sq foot lot offers huge potential to build, renovate or hold. While the home is in largely original condition it offers a very functional layout and on a street quickly becoming a collection of Dundarave 'dream' homes! With 125 feet of frontage you can enjoy lovely views of Burnaby to the East all the way to UBC and beyond to the west. Call now for more information to view! A spectacular waterfront residence with breathtaking ocean views from Lion’s Gate Bridge to Vancouver Island. Beautifully appointed, this magnificent fully gated residence offers approx. 5,673 sf, 5 bdrms, 6 bthrms, A/C, spacious living & dining rms with floor-to-ceiling glass sliders, custom kitchen with top grade SS appliances, all with walk-out access to covered outdoor patios, dining area, BBQ centre surrounding a beachside swimming pool, Jacuzzi spa & private access to a sandy beach. Up features a stunning master with 5-piece ensuite fitted with Carrera Marble stone slabs, an intimate veranda, sitting area & walk-in wardrobe closet. The lower level offers a family size media/games rm, gym, wine rm & private guest or nanny suite. 3-car garage. An incomparable oceanfront lifestyle! Evelyn at Forest's Edge by Onni! Perfectly located above Park Royal Mall. Walking distance to shops, restaurants, transits and seawall. Huge outdoor patio would be the perfect spot for watching sunset and overlooking Lions Gate Bridge. School Catchment: Hollyburn Elementary, West Vancouver Secondary. Building offers great amenities like gym, guest suite, lounge, sauna and steam, bicycle storage room, as well as fantastic management. Move in ready! There's incredible value here for this meticulous 2 bdrm, 2 bath 1,357sqft south facing suite that boasts panoramic views from Mt Baker through to the Islands. Enjoy sunrises from your private balcony off the M. Bdrm and sunsets from the L/R and adjoining balcony and solarium. The open plan living and dining rooms offer ideal space for entertaining and the large open kitchen with granite counters gives the space to prepare that special meal. Cozy up to the gas f/p and soak in those stunning views. You'll appreciate the two large bathrooms, and the jetted tub in the ensuite will ensure the stresses of the day are gone. Get fit in the gym or do laps in the indoor pool, then relax in the hot tub and sauna. Don't wait to begin living this fabulous lifestyle. Walk everywhere and bring your pet. Check out this Beautifully Updated oversized Bungalow in AMBLESIDE on a QUIET tree lined street, but only steps from Transit, Schools, Marine Drive Shopping, Restaurants and Ambleside Beach !!! This 5 bedroom, 4 bath home has 3 up and a licensed 2 bedroom suite down, laundry on both levels and crawl space with lots of storage. OPEN PLAN kitchen to a family room, and then out to a MASSIVE outdoor deck with Pergola Sun Shade, hot tub and lots of room for outdoor dining and living areas with 2 steps down to a level, fully fenced and private backyard with garage off the lane. PHOTOS & VIDEO TO FOLLOW. OPEN Thurs April 25th 10am-12pm, OPEN Thurs April 25th 6-7pm, OPEN Sun April 28th 2-4pm. Waterfront living at its best! Fully renovated, 551sqft 1 bedroom, 1 bathroom unit at The Seastrand. Ideally located at the foot of the Seawall and walking distance to Dundarave Village, shops, boutiques, pubs and restaurants. Transit 1 block away. Open House Thurs 10am-12pm. Exclusive and private estate in the Lower British Properties. The lavish open plan home has undergone a complete transformation with close to $2M in both structural and cosmetic renovations and upgrades creating a lovely oasis, offering all the amenities one could dream of. Over 10,000 square feet of living area spread over 3 extremely spacious levels, with features that include a high end gourmet kitchen, massive wrap around patio areas, indoor gym, spectacular outdoor swimming pool and hot tub, beautiful gardens and gated entry. This home also boasts a theatre, nannys quarters, and with large principal rooms, it is designed for entertainers. This is great opportunity presented at well below replacement value. This two-level Mediterranean-style house located in a quiet cul-de-sac of a gorgeous neighbourhood, steps from the Ocean and very close to public transportation. Almost 8000sf flat lot, fenced yard filled with plants and trees. Total 3 bedrooms plus a Den & 4 bathrooms, including a separate guest suite. Living Room and Bedrooms are facing South, bright. Open floor plan on Main floor, vaulted high ceiling, lots of windows and doors. Radian Heat, Water Purified system for the whole house, Rain Screen and Tile Roof. Spacious Den on main floor adjacent to a Full Bath, might be another perfect bedroom for elderly in the family.Open house on Sunday, April 21st, 1:30 to 3:30pm. Spectacular gated residence by Alan Hart on 0.5 acre. Total privacy! 7,025 sq.ft. open floorplan with entertainment-sized rms on 3 levels. Suspended staircase, reversed roof line, vaulted & floating ceilings, custom millwork & cabinets, radiant in-floor heat, 6 spacious bdrms, master w/sep sitting area & ensuite, metal clad windows & doors, custom chef’s kitchen w/brkfst bar & eating area, formal dining rm & office. Lower w/lrg rec rm, guest suite, gym, media rm, wine cellar w/tasting room. Main flr opens to pool, hot tub, covered BBQ area & sunny decks. Luxury finishings, Brazlian cherrywood flrs, commercial grd construction, gated entry w/motor court, state-of-the-art security & ambient lighting. Close to Ecole Cedardale IB PYP, Park Royal & mins to Downtown Vancouver! Truly stunning! Enjoy amazing Sunsets and Oceanfront resort-style living in this beautifully Renovated West facing corner suite with fully enclosed and incorporated balcony at the iconic Seastrand! Sweeping views of Burrard Inlet, Vancouver Island and the Northshore Mountains. This spacious 718 sq ft 1 bedroom features granite counters, stainless appl, quality cabinetry, hardwood floors + built in custom bookcase in a well-maintained concrete building with full-time Caretaker. Relax under swaying palms by the fabulous heated outdoor pool. 1 parking, 1 locker plus available Guest Suite for your visitors & lounge area for entertaining. Located just steps to the Seawall and quaint Dundarave Village shops, boutiques, pubs and restaurants. 75 Walk Score. Public Transit 1 block away. Rentals and 1 cat allowed. GORGEOUS OCEAN & SUNSET VIEWS. THE BEST VALUE IN WEST VANCOUVER from this one level living BELLEVUE plan Duplex. Located at the top of the complex in a little cul de sac where its private and quiet. 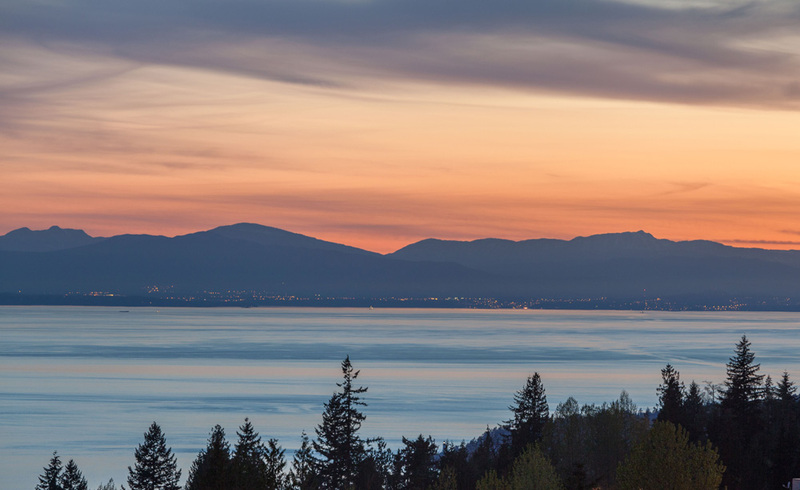 Where else can you get these views and a West Vancouver address for this price? Nowhere! This home is a rare Bellevue plan. Views straight over Howe Sound from Horseshoe Bay to Anvil Island and beyond to the glaciers without looking out over lower roofs in the complex. The architect owner has put $70,000 into updates.The main floor includes the living, dining room, entertainers kitchen, den/office plus the master bedroom w/ensuite, laundry and powder room. Below there are 2 more bedrooms, a 372 sq ft rec room and BONUS an extra 513 sq ft of storage space. Hurry this one's a winner! Located among the most scenic areas along the Sea-to-Sky, I'm proud to showcase this gorgeous custom home that sits nestled along this quiet neighbourhood. It's an absolute dream home, perfect for downsizers looking to live closer to the city from Whistler/Squamish, or get away from the city for endless days of golf just steps away at Furry Creek Golf Course, one of BC's best. This open place residence features 2,789 sf of living on 2 floors, plus you'll notice beautiful custom work throughout, maple hardwood flooring, chef-worthy appliances and plenty of storage. The best of retirement living among total privacy, jaw dropping mountain views and steps to an active outdoor lifestyle! Stunning views of the city, ocean, bridge. This house has been lovingly kept and updated over past years and offers an open & bright floor plan with 7 bedrooms, 3 bathrooms & spacious family & living room. Lower level has a good size rec room. Other nice features would be spacious private level back yard, a big deck facing the great views of the ocean, city and the bridge and walking distance to Sentinel & Chartwell Schools. This beautiful home is ready to move into, or build your dream house, this is now "ONE" rare chance in the most desirable location of West Vancouver.